Montana is playing in the NCAA tournament for the 12th time in school history, including the fifth appearance in the past decade. Montana is 2-12 all-time in the Big Dance, beating Utah State in 1975 – its first-ever tournament game – and upsetting No. 5 seed Nevada in 2006. There have been eight 15-over-2 upsets since the NCAA tournament expanded its field to 64 (now 68) teams in 1985, including four in the past seven years. It happened most recently in 2016, when Middle Tennessee knocked off Michigan State. 1975 R32 Utah State W, 69-63 Pullman, Wash.
R16 UCLA L, 67-64 Portland, Ore.
Con. UNLV L, 75-67 Portland, Ore.
1991 R64 UNLV L, 99-65 Tucson, Ariz.
2010 R64 New Mexico L, 62-57 San Jose, Calif.
2012 R64 Wisconsin L, 73-49 Albuquerque, N.M.
2013 R64 Syracuse L, 81-34 San Jose, Calif.
2018 R64 Michigan L, 61-47 Wichita, Kan.
Montana is playing in the NCAA tournament for the second season in a row after winning both the Big Sky Conference regular-season and tournament titles. The Grizzlies faced the nation’s 43rd-toughest non-conference schedule, coming away with a 7-4 record, including wins over NCAA tournament participants Georgia State and North Dakota State. They then went 16-4 during Big Sky play, repeating as conference champions behind a balanced scoring attack and pesky defense, before qualifying for March Madness with three wins in the conference tournament last week in Boise, Idaho. Montana, winners of 15 of its past 17 games, won the Big Sky Conference regular-season and tournament titles for the second year in a row. Montana became the fifth program in Big Sky history to win both the Big Sky Conference regular-season and tournament titles in back-to-back seasons. Over the past two seasons, the Grizzlies have won 52 games, the best two-year stretch in school history. Montana has posted a .500 or better record in 11 consecutive seasons and has won 20-plus games in four of five seasons under Travis DeCuire. Montana is shooting .497 on the season (8th in NCAA), and has made at least half of its shots 20 times. Conversely, Montana has held opponents under .400 shooting 10 times (10-0). Montana is one of 19 schools nationally to rank in the top 100 for scoring offense (76.8) and defense (67.4). Montana finished the regular season with three players ranked in the top 20 in the Big Sky for scoring, not including Jamar Akoh (16.3), who did not play in enough games to qualify. Montana has held opponents under their season scoring average in 27 of 33 games. During Big Sky play, the Grizzlies led the league for rebounding defense (29.8) and rebounding margin (+5.3). Montana has forced at least 10 turnovers in 82 of the past 85 games played dating back to the 2016-17 season. Fifteen of Montana’s 25 wins have come by double digits, including seven by at least 20 points. Montana is 15-0 on the year when scoring at least 80 points. Montana is 24-2 on the season when shooting a better percentage than its opponent. Montana is one of 12 schools nationally with three 1,000-point scorers on its current roster. Ahmaad Rorie and Michael Oguine both joined the 1,500-point scoring club last month, two of nine players in Griz history to reach the career milestone. Rorie was the fastest to do so in school history. First-team All-Big Sky selection Sayeed Pridgett is averaging 20.2 points per game over the past 13 contests, leading the Griz for scoring eight times. Overall, his .610 shooting percentage ranks 19th nationally. During a two-game stretch from Feb. 16-23, Kendal Manuel (Big Sky Top Reserve and Co-Newcomer of the Year) was 11-of-13 (.846) from deep. He finished Big Sky play ranked first with a .896 free-throw percentage and fifth for three-point shooting (.438). Two-time, first-team All-Big Sky pick Ahmaad Rorie led the league with a 3.0 assist-to-turnover ratio. He hasn’t had a negative assist-to-turnover ratio since Dec. 19, and over the past 13 games has a 3.9 ratio, with at least four assists in each contest. In addition to more than 1,500 career points (seventh in school history), Michael Oguine ranks third for career steals (159) and is among the leaders for career starts (121). He has 10 steals in the past three games. Senior Bobby Moorehead (133) has played in more games than any player in school history. With a veteran group, four starters have played in 100 or more career games. Montana’s four graduating seniors have started a combined 361 games during their Griz careers, including every game played over the past two seasons. Only Hartford, Nevada and Jacksonville State average more years of experience than Montana (2.49 years per player). Travis DeCuire won his 100th career game on Feb. 9. He now has 109 wins, more than any UM coach through his first five seasons. During Montana’s 10-game winning streak (Jan. 12-Feb. 23), the Griz trailed for just 29 minutes (approximately 7.3 percent of action). Montana has won 26 of its past 28 home games. The Grizzlies are one of 20 teams nationally to lose two or fewer home games over the past two seasons. They drew more than 4,000 fans per game, a better average than three Pac-12 schools. Montana’s 7-4 non-conference record was its best since 2010-11, and came against the nation’s 43rd-toughest schedule. More impressive, the Grizzlies had their full roster available just twice. 2018 all-conference forward Jamar Akoh has missed the past 12 games with a knee injury. He has missed 19 games overall this season. Michigan is 28-6 on the year, advancing to the championship game of the Big Ten tournament. The Wolverines are ranked No. 8 in this week’s AP top-25 poll. Michigan is in the NCAA tournament for the ninth time in the past 11 seasons, advancing to the Sweet 16 four times during that span and the Final Four twice. The Wolverines returned three starters from last year’s squad that played in the national title game, including junior Zavier Simpson, who leads the team for minutes, assists and steals. Canadian freshman Ignas Brazdeikis averages a team-best 15.1 points per game. He is one of six players averaging at least 8.0 points per contest. Brazdeikis and Simpson were named to the All-Big Ten second team, while Charles Matthews, Jordan Poole, and Jon Teske earned honorable mention honors. The Wolverines have one of the nation’s best defenses, allowing just 58.6 points per game (second in NCAA). While Montana ranks in the top 10 for field-goal percentage (.497), the Wolverines rank in the top 20 for field-goal defense (.399). Similarly, Montana ranks 30th in the NCAA for three-point shooting (.380) while the Wolverines rank fifth for three-point defense, allowing opponents to shoot just .289. Michigan leads the nation with just 8.9 turnovers given up per game. Michigan is averaging 8.0 three-pointers per game and has three player with 48 treys or more this season. Teske leads the Wolverines with 6.9 rebounds per game, posting eight double-doubles. Five players average at least 4.0 boards per game. Michigan has five players on its roster who have played in the NCAA tournament, including Matthews, who had a double-double with 20 points and 11 rebounds in last year’s game vs. Montana. John Beilein is in his 12th season leading Michigan. The veteran coach has more than 800 career victories (all divisions) and led Michigan to the 2013 and 2018 national championship games. Montana and Michigan will be meeting for just the second time in school history, but the first matchup was fairly recent, and in a similar setting. The Griz and Wolverines squared off in the opening round of the 2018 NCAA tournament from Wichita, Kan. Michigan won 61-47, propelling the Wolverines to the national championship game vs. Villanova. Montana jumped out to a 10-0 lead over the Wolverines, holding Michigan scores for the first 4:16 of the contest. During that span, Michigan was 0-for-4 from the floor, turning the ball over twice and committing three fouls. In the 39 games since Michigan and Montana last met, the Wolverines have trailed by more than 10 points in a game just four times. Montana led for more than 13 minutes in the first half and entered the locker room trailing by just three (31-28). Montana held Michigan to 61 points, its lowest total in its past 10 games and second-lowest among its six games in the NCAA tournament. In the second half, Montana missed 12 consecutive shots at one point and were held scoreless for 9:56, allowing Michigan to turn a three-point lead into a 14-point advantage. The scoring drought would prove to be the backbreaker for the Griz. Once Montana scored again, the Grizzlies out-scored the Wolverines 14-9 over the next 7 minutes, and over the final 10 minutes overall the two teams each scored 17 points. Michigan entered the contest ranked No. 2 nationally with just 9.1 turnovers per game. A strong defensive effort forced the Wolverines into 14 miscues, however, their second-highest total of the season. For the first time all season, they had a negative assist-to-turnover ratio (-3). Playing in his first NCAA tournament game, Michael Oguine had 15 points, including a thunderous dunk through the lane. He also added seven rebounds and three assists. 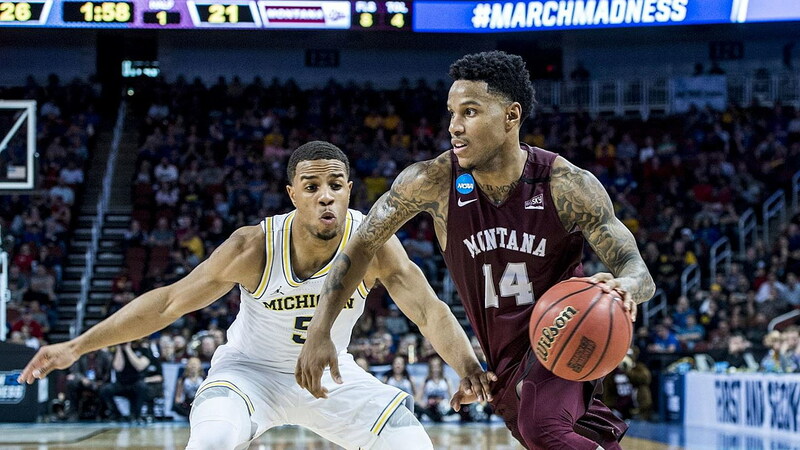 Ahmaad Rorie was the only player on Montana’s roster with prior NCAA tournament experience – advancing to the second round as a freshman at Oregon. He finished with 15 points, seven boards, two assists and two steals. Hindered by a 0-for-12 stretch in the second half, Montana shot just .321, including .200 from beyond the arc. Throughout its history, it’s hard to find many teams across the region with more success than Montana. The Grizzlies have won 12 regular-season conference titles, 11 tournament championships and are playing in the NCAA tournament for the 12th times. Perhaps Griz fans have never had it better than the last several years, however. Over the past eight seasons, Montana has won five regular-season Big Sky titles, finishing runner-up two other times. Montana has also won five tournament titles in the past decade. The Grizzlies are on top of the Big Sky for the second consecutive season, winning both the regular-season and tournament titles. Montana was the most-recent team to go back-to-back in the regular season, doing so in 2012 and 2013, as well as 1991 and 1992, when Travis DeCuire was a player. Montana followed its regular-season title up with a tournament championship, becoming the fifth program in school history to win back-to-back Big Sky Conference regular-season and tournament championships. Again, the 2012 and 2013 Grizzlies were the last to do so. No Big Sky school other than Montana has done it since 1982. Four Grizzlies were recognized by the Big Sky Conference last week, headlined by first-team all-conference selections Ahmaad Rorie and Sayeed Pridgett. For Rorie, it was his second consecutive first-team nod, while Pridgett was recognized for the first time. Michael Oguine also earned his second all-conference pick, being named to the third team, while Kendal Manuel, a Billings native who transferred from Oregon State, was named both the Newcomer of the Year (co) and Top Reserve. Montana had three of the 15 all-conference selections, tied with Eastern Washington for the most. The Grizzlies were also the only team with two first-team selections. Last weekend, Rorie and Oguine added additional hardware, with Rorie being named the Big Sky tournament MVP and Oguine being named to the six-person all-tournament team. Rorie averaged 18.7 points per game on .537 shooting, also averaging 5.7 rebounds per game and 4.0 assists. He had 28 points in Montana’s win over Weber State in the semifinals, its largest margin of victory in school history (29 points). Montana’s 52 victories over the past two seasons are more than any other Montana team has achieved over a two-year span. The current Grizzlies were previously tied with the 2011-12 and 2012-13 seasons and the 1990-91 and 1991-92 campaigns, when Travis DeCuire was a player. Coincidentally, those are the three instances in which Montana has won back-to-back Big Sky Conference titles. Specifically in Big Sky play, Montana’s 32 wins over the past two seasons are tied for the most in Big Sky history (along with the 2012/2013 and 2013/14 Weber State teams). Montana’s rivalry win over Montana State (Feb. 23) gave the Grizzlies their 20th of the season, an impressive accomplishment that has become the norm in Missoula. Montana, though, has done it consistently of late, doing so for the fourth time in the past five seasons, something that has been accomplished just five other times in the history of Griz basketball. Montana will graduate an historic senior class, saying farewell to seniors Jamar Akoh, Bobby Moorehead, Michael Oguine and Ahmaad Rorie. The group, specifically Moorehead and Oguine, who have been part of the past four seasons, have been a key component for one of the best classes in school history. Over the past four seasons, Montana has won 89 games, tied for the second-best four-year stretch in school history. Will Cherry’s 2013 graduating class holds the record with 93 wins from 2010-13. Not only has Montana won more games in the past two seasons (52) than in any two-year stretch in school history, but the Grizzlies are also one of just 21 schools nationally – entering the tournament – who have won at least 25 games in both 2017-18 and 2018-19. The list includes Buffalo, Cincinnati, Duke Gonzaga, Houston, Kansas, Kansas State, Kentucky, Michigan, Michigan State, Murray State, Nevada, New Mexico State, North Carolina, North Carolina-Greensboro, Old Dominion, Tennessee, Texas Tech, Vermont and Virginia. Montana won the tournament for the 11th times (more than any other team) and has advanced to the finals on 20 occasions (also first). Montana is 43-29 all-time in the Big Sky tournament, the second-most wins of any Big Sky team. Montana has played in the tournament championship game eight times in the past decade, including four times in five years under Travis DeCuire. Since Montana’s first tournament title in 1991, the Grizzlies are 11-4 in the championship game. No team has won more titles during that span. Montana has won eight consecutive semifinals games since 2010. The Grizzlies became the 11th team ever to repeat as tournament champions. With its win over Northern Arizona (March 4), Travis DeCuire earned his 105th win as head coach of the Griz (he’s now at 109). The number is the highest total ever by a UM coach through his first five seasons. Blaine Taylor, DeCuire’s head coach while he was a player, had 104 wins through his first five seasons. Other notable coaches are Stew Morrill (98), Wayne Tinkle (91), Mike Montgomery (89), Jud Heathcote (80) and George Dahlberg (70). DeCuire is the only coach in UM history to win 20 or more games in both of his first two seasons (he’s now done it four times). The 2018 Big Sky and NABC District 6 Coach of the Year is also the fastest coach in Big Sky history to win 50 league games. His .763 winning percentage ranks third in league history, and is first among those who coached more than three seasons. Overall, only two Big Sky coaches have ever averaged more than DeCuire’s 21.8 wins per season, and both coached three or fewer seasons. In its history, eight different Griz coaches have won a Big Sky Conference regular-season title. Three coaches – Blaine Taylor, Wayne Tinkle and DeCuire – have won two, but DeCuire is the only one to earn three regular-season titles. He now also has two tournament championships to his credit, leading the Grizzlies to back-to-back titles. Montana remains one of the top shooting teams in the country, shooting .497 from the field. The figure leads the Big Sky and ranks eighth nationally. The Grizzlies have made at least half of their shots in 20 games this season. Montana made a season-high 15 three-pointers vs. Montana State (one shy of tying a school record), and impressively did so on 50.0 percent shooting. Montana has made at least eight three-pointers in 22 of 34 games this season. The Grizzlies reached eight treys just four times in all of 2017-18. On the season, Montana is shooting .380 from beyond the arc (30th out of 351 Division-I teams) and is averaging 8.3 makes per game (118th). A year ago, the Grizzlies shot .339 (236th) and made just 5.5 per game (331st). A big difference is the addition of Pac-12 transfers Donaven Dorsey and Kendal Manuel. Both ranked in the top five in Big Sky play, helping the Grizzlies connect on 39.1 percent of their long-range shots during league action. Dorsey is shooting .453, including a game vs. Northern Colorado (Feb. 25) in which he shot 6-of-7. Manuel is shooting .432, including a two-game stretch in which he was 11-of-13 (Feb. 16-23). Montana won another Big Sky regular-season title, and it’s easy to see why: Of the 21 statistical categories, Montana ranked in the top three of 14 of them. The Grizzlies led the league for scoring margin, field-goal percentage, three-point percentage, rebounding defense and rebounding margin. Over the past four seasons, senior Bobby Moorehead hasn’t missed a game, let alone a practice. The Tacoma native has played in 133 career games, more than any player in school history, including 71 consecutive starts. Montana is in rare company, with three 1,000-point scorers on its current roster. There have been just 34 players in school history to score 1,000 career points, and never before have three been on the floor at the same time. Making the feat even rarer, Montana is one of just 12 schools nationally to have three current 1,000-point scorers (Ball State, Hartford, UIC, Lipscomb, Kansas State, Montana, Nevada, Northwestern, TCU, The Citadel, Virginia Tech and Washington). Michael Oguine recently became the eighth Griz player to join the 1,500-point club. Two nights later, Ahmaad Roriejoined his teammate, becoming the only Griz player to reach the figure in three seasons. Just four other teams across the country currently have a pair of 1,500-point scorers at their respective universities (Buffalo, College of Charleston, Marshall and Oregon State). While there have been some great scorers in Montana history, never before have there been two this good playing at the same time. Rorie and Oguine are currently tied for sixth place in school history with 1,644 points. Even more impressive, they’re both having success on a team loaded with offensive weapons, and they’re not limited to just scoring. Including his stats at Oregon – 149 points and 66 assists as a freshman in 2014-15 – Rorie is part of the exclusive 1,500-400 club. Only 1` active players across the NCAA have scored 1,600 career points and dished out at least 400 assists. Despite standing 6-2, Oguine has collected 600 rebounds and is one of six active members of the 1,500-600-150 club, recognizing career points, rebounds and steals. Through 21 games as a starter, junior Sayeed Pridgett was averaging 12.2 points per game, up significantly from the 8.4 he put up as a sixth man in 2017-18. Over the final 10 games of the regular season, however, Pridgett broke out, averaging 20.7 points on .685 shooting, leading the Grizzlies in scoring eight times. Pridgett was named the league’s player of the week in back-to-back weeks, becoming the first Grizzly to do so since Brian Qvale in January 2011. During the two-week span, Pridgett averaged 22.8 points per game on .731 shooting, in addition to 9.0 rebounds and 3.0 assists per game. Montana is one of 19 teams across the country to rank in the top 100 nationally for scoring offense (76.8 points per game, 71st) and scoring defense (68.3 points allowed per game, 93rd). Travis DeCuire preaches defense first, and it shows, as Montana has held its opponents under their season scoring average in 28 of 34 games this season. Montana’s defense can be felt across the board. The Grizzlies are one of two Big Sky teams to limit opponents under 70.0 points per game. The Grizzlies rank second for field-goal defense (.437), third for three-point defense (.344), third for steals (6.5) and fourth for turnover margin (+1.2). Perhaps most notable, Big Sky opponents averaged just 29.8 rebounds per game against the Griz, leading to a +5.2 rebounding margin (both first). Collectively, Montana’s defense went up against the 12th-toughest offensive schedule in the country during non-conference, with three of its opponents ranking in the top 20 nationally for scoring: Georgia Southern (87.0 points per game, 11th), Creighton (84.8, 14th) and South Dakota State (84.7, 16th). During an eight-game stretch from Dec. 3-Jan. 3, Montana held its opponents to 63.1 points per game. Not only does Montana hold one of the nation’s top field-goal percentages, but the Grizzlies are also getting production from multiple weapons. Montana is one of two Big Sky schools to have three players rank in the top 20 in league play for scoring; the Grizzlies had a fourth, but Jamar Akoh no longer qualifies due to playing just 11 league games. When Montana lost its all-conference big man to a knee injury in early February, the Grizzlies didn’t hit the panic button, despite losing the likely Big Sky Player of the Year up to that point. First of all, the team played seven non-conference games without Akoh, and one month into the season led the entire country for field-goal efficiency. Secondly, while the Grizzlies lose some strengths without Akoh on the court, it opens up some other opportunities. In the 13 games since Akoh last played, Montana is still averaging right around its season average for scoring (76.2 points per game), and the defense has improved, allowing just 66.6 points per game. The biggest areas of growth, however, have come in field-goal efficiency (Montana is shooting .513 over the past 13 games, including .402 from beyond the arc) and rebounding. Despite not having their big man, Montana has virtually the same rebounding margin and is allowing three fewer boards per game.